Since the beginning of the 2017 transmission season and as of 28 September 2017, Italy has reported 49 cases, Greece has reported 47 human cases, Romania 45 cases, Hungary 16 cases and Austria has reported four cases. In addition, Serbia has reported 36 cases, and Israel has reported nine cases. Fifteen deaths due to West Nile fever have been reported since the start of the transmission season: Romania reported seven, Greece reported five, Hungary, Italy and Serbia reported one. West Nile virus is a mosquito-borne flavivirus that is maintained in an enzootic cycle between mosquitoes and birds. Humans and horses are incidental dead-end hosts. Between 21 and 28 September 2017, six new cases were reported by Romania. Austria, Hungary Greece and Italy reported two cases each. Serbia reported eight new cases. All cases were notified in previously affected areas. Three deaths due to West Nile fever have been reported by Greece, Hungary and Italy this week. 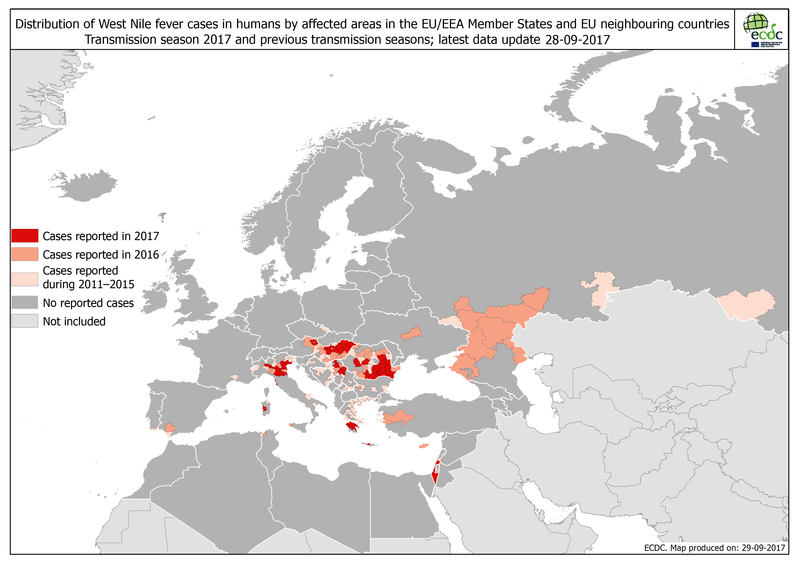 In addition, Italy reported eight West Nile fever equine cases and Greece reported one West Nile fever equine case through the Animal Disease Notification System of the European Commission.